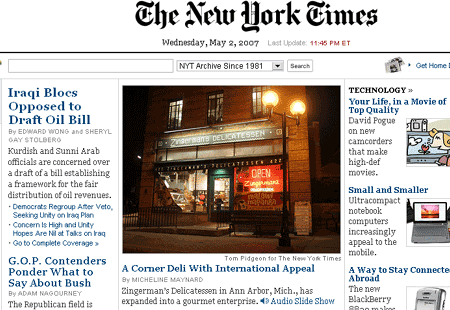 Last night Zingerman’s Deli popped on the NYTimes front page. They are celebrating their 25th anniversary. I think most mild-minded Ann Arborites have a love-hate relationship with Zingerman’s. The sandwiches are clearly superior to anything else I have had, but does that justify the $13 cost? Similarly, they are a great source of high quality deli items, many of which you can’t get anywhere else around, but again is the high cost worth it? In some cases, such as the tea and the olive oil I find the cost clearly not worthwhile. On the otherhand, bread, hot chocolate and gelato are some of the things that I really enjoy buying there, despite the price. Plus, it’s handy that they are only 1 block away from my house and open until 10. The customer service is also a mixed bag: they are ultra friendly and the samples flow freely, but often the praise they heap upon their products is so much as to be feel synthetic and pushy. You should check out the multimedia presentation that goes with the article, the cake Monica bought to celebrate my preliminary exam (I passed!) is in photo number 7 (the “Drum cake”). It’s pretty much a whipped and colored stick of sweet butter, not that there is anything wrong with that.